House of Fraser - but not as you know it! When I've shopped at House of Fraser in the past, I'm not entirely sure that I've thought of it as a shopping "experience". Generally it's more of a functional and box ticking experience - which is fine, that's what lots of department stores are about and in fairness, I wouldn't necessarily expect much more than that. So when I was asked to pop along to the newly refurbished Gracechurch store in Sutton Coldfield, I wasn't quite sure what to expect. But, and I know that some might think that I'm bound to say this, I absolutely loved it. So I'll explain why - but obviously as many of you quite possibly don't live close to Sutton Coldfield, I've included images of some of my favourite pieces that I think might appeal, irrespective of where you live. Luckily I arrived just in time for "elevensies" or really "half-past ninesies" but let's not split hairs. As Caffe Botanico was situated on the ground floor (like your thinking there House of Fraser) I thought that it was a very good place to start. In my humble opinion you can always tell a lot about a place from its café - and if at the same time you can get interiors inspo, even better. I've definitely got a thing for herringbone at the moment, so I loved this area. And if it's grey herringbone with a splash of bright yellow, even better. And as well as the gorgeous cakes on offer, I loved the grey metro tiles, which is handy as we're having our bathroom re-done next year so that's two lots of tile ideas that I now have. Now this is one mighty cake display. I must admit to having a couple of Italian pastries but I kind of accidentally ate them before photographing them. You will obviously be pleased to hear that they were delicious though. And although I am absolutely not a coffee fan, I do love a frothy milk - the frothier the better because actually I don't really like warm milk - just the froth. This one was spot on and the girl brought it over to me which I thought was a really nice touch, particularly for elderly customers or for those struggling with children and pushchairs. And the girl was lovely "You're having a cappuccino without the cappuccino aren't you?" What a great display courtesy of Dune! In keeping with other House of Frasers stores the shoe department is now situated on the ground floor along with bags and beauty which is refreshing for the staff as previously they were located in a dark corner upstairs. I chatted to the staff in the shoe department and they explained how the store was so much better organised now with all womenswear together, rather than over two floors. The menswear is no longer on the same floor as womenswear and everything is just better organised. In fact the store was buzzing with excitement - everyone seemed to love the open plan feel of the store, the new wooden floor as opposed to the traditional carpet and also how light it is. And importantly, there were plenty of staff around. Can you imagine my distress, albeit short lived, at Whistles being cordoned off with red and white tape whilst they set up? I was almost as distressed as if I'd witnessed a scene out of Casualty. It was fantastic to see Whistles in a smaller West Midlands town. Whilst it happens in the south of the country, our Whistles' are generally located in the major cities, so this is a real coup. It wasn't long before things were definitely starting to take shape in the Whistles department. Plus the store also stocks Joules, Mint Velvet, French Connection, Oasis, Warehouse, Phase Eight and Barbour along with their own house brands, which are really strong. What I really liked about this store was the size and shape of it. It's very symmetrical and because it's now open plan, it's possible to see from one side to the other. Plus the modern styling of the concessions and the lovely pale grey wood flooring (more interiors inspo) make the womenswear department feel like a large boutique, as opposed to a department store. There is also a menswear department stocking Hugo Boss and Tommy Hilfiger, as well as a children's department with brands such as Barbour, Ralph Lauren and Joules. Below you can see a little bit of Joules. I always love Joules for some jolly wellies and their general bright and cheery colour palette is always welcoming on a dark wintery day. Plus there's quite a lot of sparkle at Biba. I love a bit of Biba - you always know where you are with it and there's nothing shy and retiring about Biba. Ooooh and with all things "floral maxi dress" being so big at the moment, I thought that I'd share this lovely one from French Connection. After having a good look at womenswear, I headed up to the second floor, which houses another café and the interiors section. I've always rated the homewear at House of Fraser as it has such a great selection of well established brands. Plus Linea always has something exciting to offer. 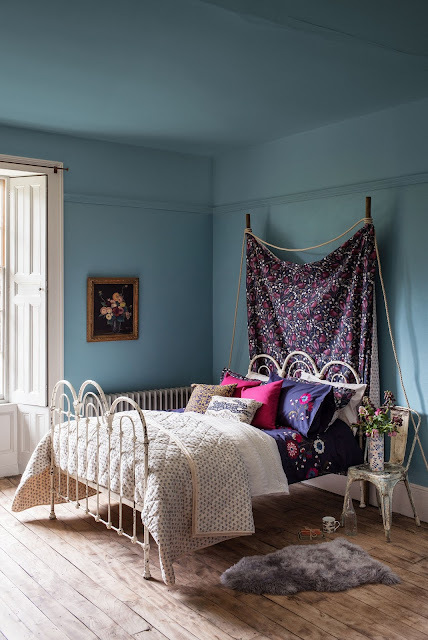 I have a bit of a thing for coloured glasses and I thought that this set from LSA (£32) were just lovely for when friends come round for drinks - or even when they don't. I have some displayed on a shelf in the kitchen and they make me smile every time I look at them. There was also a great selection of fake fur cushions and throws. 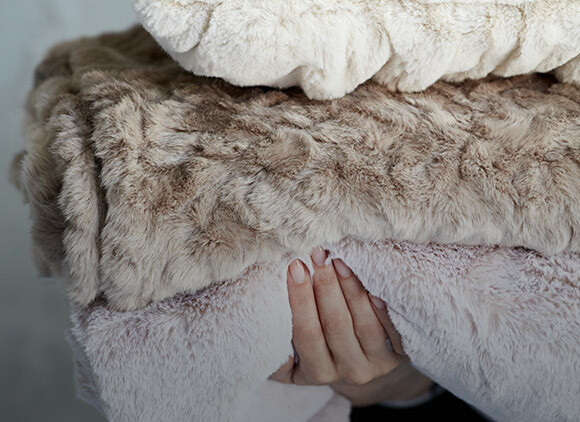 I've been after a grey sheepskin rug for a long time now and they had just what I was after here, so I snapped that up with 20% off at £36. And there's just something so lovely about new dinnerwear. Again Biba comes up trumps with this range of Biba Starburst Dinnerwear which would look fabulous on a Christmas lunch table. And this was the other dinner set that I really thought was really rather special. It's the deco peacock range, again from Biba. I realise that my shots aren't quite as good as those on the site but I keep reading that life is all about celebrating the imperfect, so I'm going to run with that. And there was a danger that I may well have had a Calamity Jane moment and knocked everything over, had I moved things too much. I was also really excited to come across this range which is a collaboration between Ellen de Generes and Royal Doulton. The assistant there was proudly dusting the range, which we had a good old chat about for quite a while. This has to be my favourite mug...it's just all about the message really. We all love giving, and receiving, a bit of kindness don't we? 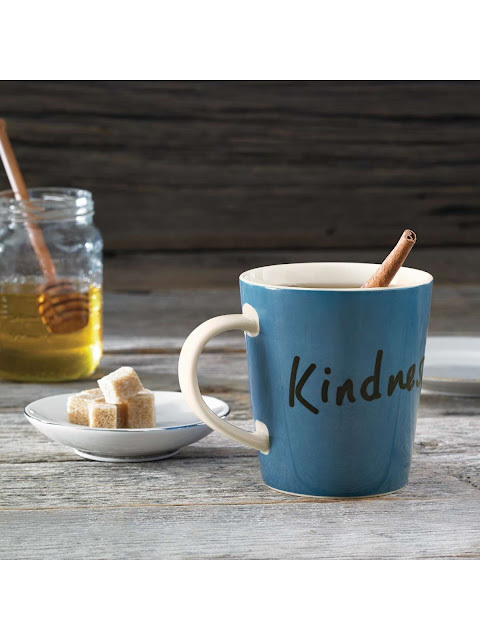 (Kindness mug £10) but equally the "Joy" and "Be Amazing" mugs are stunning too. And I can't help but love this "Love" range, also from Ellen DeGeneres and Royal Doulton (£35). The tablewear collection is "inspired by both Ellen and Royal Doulton's love for artisanal, yet simple designs." Hello Santa are you listening? Now some of you may think that this is ever so slightly odd but before I left the store I went and checked out the bathroom. Now I have specifically used the word "bathroom" because, as I mentioned earlier, I am gathering bathroom inspiration. And it sounds better than saying that I decided to go and check out the loos. Anyway, that aside, they're lovely aren't they? The official launch event takes place on Thursday 9th November and if you're anywhere near to Sutton Coldfield I would really encourage you to go along for a spot of retail therapy in the nicest possible setting. Labels: dune. biba, French Connection, House of Fraser, hugo boss, Joules, Mint Velvet, Oasis, phase eight, tommy hilfilger, Warehouse, Whistles. These Aldo shoes at House of Fraser (£60) were about the closest that I could find in terms of price, heel height (although they look a little higher than mine) and toe shape. The T-bar part is lacking but other than that, they are really similar. The Kurt Geiger Yasmin courts at House of Fraser (£220) are similar in style too, with a crocodile print worked in there. Quite a lot of the Kurt Geiger styles are on sale on the KG site so it maybe worth looking there for a cheaper option if you really like them. For a block version heel, also with a crocodile print, these Ella shoes at Kurt Geiger are a nice option, and they are down to £49 from £195. The Mercada shoes at Kurt Geiger are down from £220 to £109. They have a pretty jewelled strap, which would work really well with rolled up jeans. The Maniah silver shoes by Kurt Geiger (£95) have the T-bar but not the closed in toe. I love the studded ankle straps and the heel height is good. Great for those with slim ankles! The Millie sandal by Hobbs NW3 (down to £75 from£129) is just a lovely everyday sandal, rather than necessarily being similar to the style that I am wearing - although they could be worn in just the same way and with their block heel, they are probably slightly more versatile for the day time too. 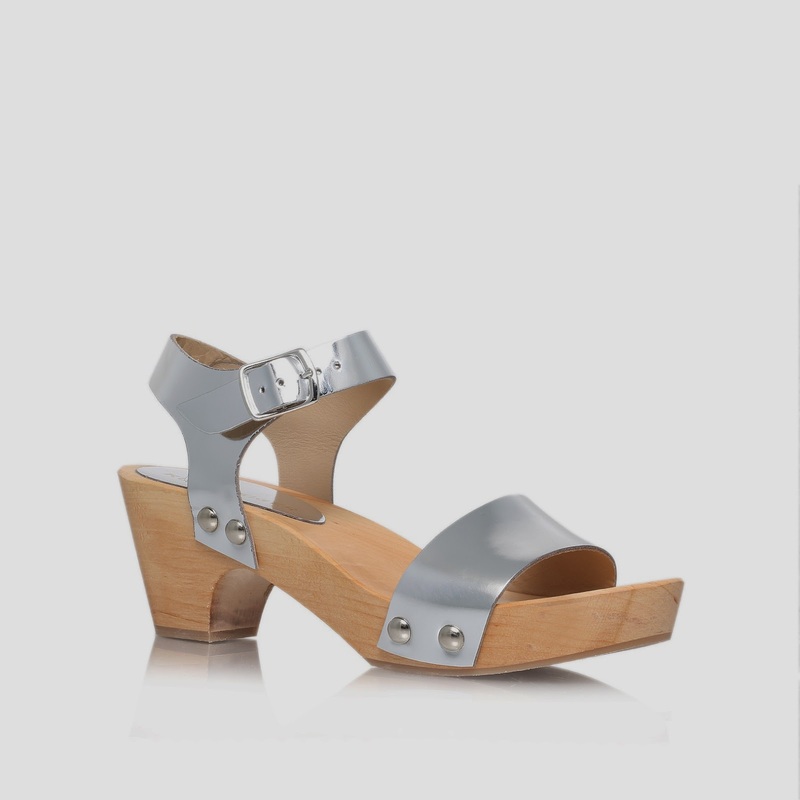 And following on from my post on wooden and cork soled shoes the other day, I love these wooden silver shoes by Kurt Geiger (£120). They have a really great day time heel height to them and will instantly update jeans, utility trousers, cargos and chinos for the spring. 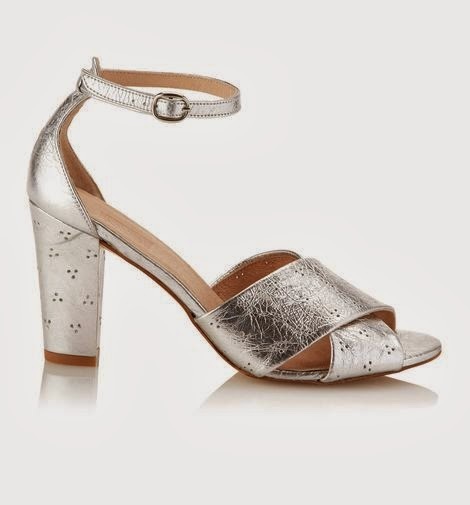 Finally, although this post is meant to be about silver shoes some prefer gold, so these gold shoes by Kurt Geiger (£55) have earned themselves a place for their price, heel height and shape and general all round versatility. I really hope that you have enjoyed some sun over the weekend. It makes such a lovely change doesn't it? Tomorrow I am working on a short film/promotional video and I see from the call sheet that as part of that, I will be working with a.....horse. Hmmmm - I'm not quite sure which end I would rather be.